Guava is a platform created by Thalia Hoffman for various art actions. All these acts—films, performance, participatory actions, and research—challenge conventions regarding physical and ideological movement in the Middle East, and examine the possibility of imagining the region open to movement. The spaces of Mamuta at the Hansen House in Jerusalem—where Hoffman’s platform resides—serve as a kind of safe haven for the works she created in recent years, and for the new works that she has created especially for the Mamuta spaces. The exhibition also features a study group and radio programs that host various people. All these make Guava a living space that echoes the voices of those who choose to take part in it. Hoffman’s endeavour is consistent: in each of the constituent works of the platform, she probes the boundaries of space in relation to the body or the limitations that the body itself produces in space. In the film Guava (2014), two characters set off on foot from Jaffa to Tel Aviv, to Beirut, in their quest for another future: one tries to recall memories while walking, while the other tries to forget. Between memory and forgetfulness, they manage to continue to walk together. The path that they take was marked—while the film was being made—both on the ground, and through a website with stencils for marking roads. Visitors to the website are invited to download the stencils and use them to re-mark the roads between Jaffa-Tel Aviv and Beirut. The actual path and the forgotten one, as well as the characters’ walk in the film, were the starting point of the platform. Through it, various ways of searching, desire, impulse and holdups are discovered, in an attempt to maintain an open space for movement here. In another film, Sham [There] (2016), a truck is parked on a path in the Judean foothills. Over a period of 24 hours, people and items pile up on the truck. The characters alternate between speaking Arabic and Hebrew, and are situated between a blurred past and a hidden future. All are seeking to reach a different place, physically and consciously. The film A Day Becomes (2018) takes place in the northeastern Golan Heights, at dawn. 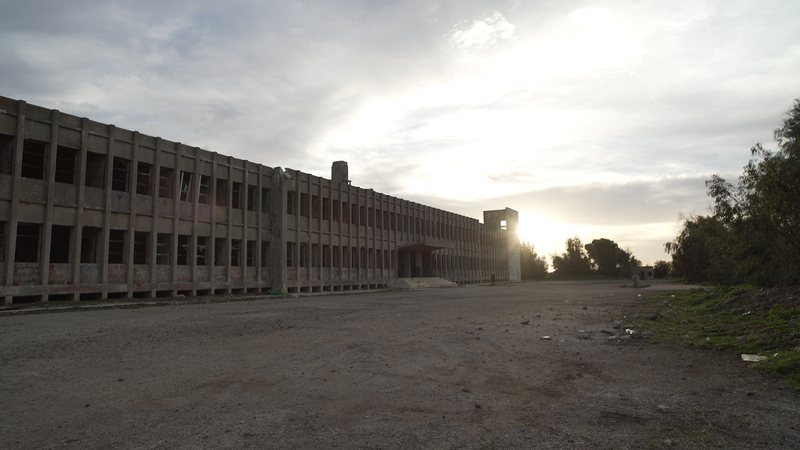 The only character in the film moves from night to day through a multi-story building and rooms that once served as the head of the Syrian Quneitra district headquarters. Today, the building stands abandoned and broken, overlooking the ruins of the city of Quneitra. In this film, too, we accompany a figure at a detached moment of transition. Hoffman also works with taste and smell. Attar (2017) is a collection of fragrances created by the artist in collaboration with the Art Gallery of Beit Hagefen. The collection was created by steaming and repeated distilling of the aromas produced by local crops. In the current exhibition, smells will be collected of the earth on which the various artworks of the platform were produced. Besides, visitors will also be able to eat and drink fermented fruits and vegetables that were grown in the space. Fermentation is the beginning of the digestion process that takes place in the exhibition space and continues in the body of the one who eats them. Guava invades all five senses—sometimes gently, sometimes abruptly—to allow the visitor to experience a momentary crack/ split within—a jolt, or fleeting discordance. To smell the earth without possessing it. To allow memory to deceive us, to disrupt the present, confuse it, and divert it momentarily from the direction it is pulled toward. Here, at this erstwhile lepers hospital, Guava offers refuge from the wounded landscape.